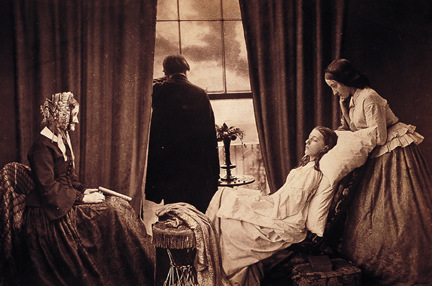 The Victorians were obsessed with death – in a nice way. There was a code of etiquette for both the living, and the deceased. The reasons for their "undying" interest were numerous; death was an every-day occurrence, it happened at home, and mourning was a way of life - a mourning period could last over two years. 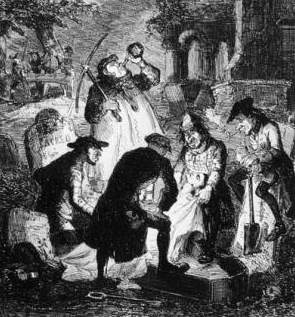 A few of the main death fears held by Victorians included being buried alive, being dug up by body snatchers, and the horrible decay that the body went through. 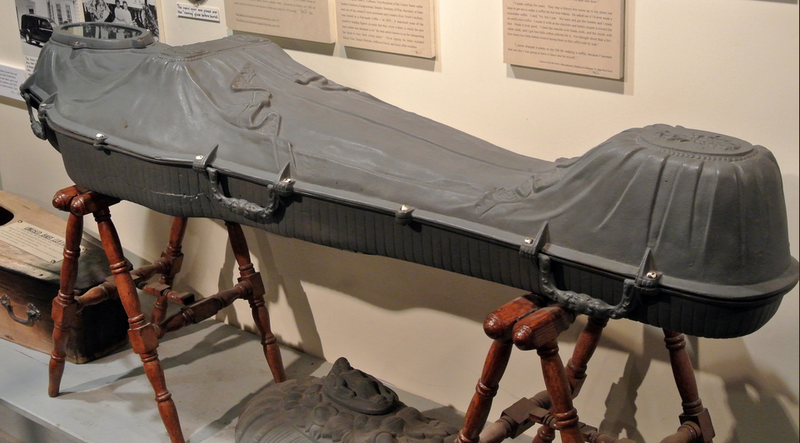 Almond Dunbar Fisk patented a product in 1848 to alley all three fears with his “air-tight coffin of cast or raised metal.” With a Fisk Iron Coffin, the deceased was visible for viewing (and making sure they didn’t move.) The remains would be well preserved, continuing to look exactly as they did when they died, and iron coffins were almost impossible to break into. 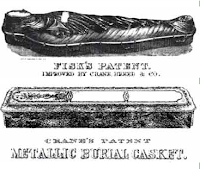 The Fisk Metallic Burial Case was shown at the New York State Agricultural Society Fair in 1849, along with the American Institute Exhibition in New York City later that year. Orders were taken and production began. The coffin was form fitting, resembling an Egyptian sarcophagus with the face and feet higher than the body. A small glass window was fit above the face for viewing. 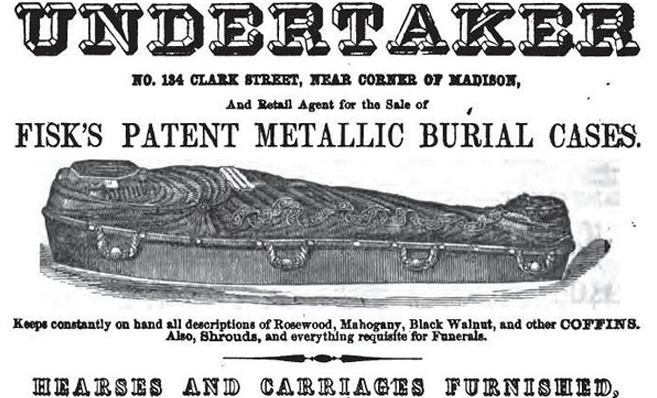 There were several benefits to using an iron coffin including the smell of decay was trapped in the iron case much better than a wooden coffin. Resurrectionists were not able to “bash and grab,” (Bust open a wooden coffin and pull the deceased out by their neck for the purpose of selling bodies to anatomy schools.) and they looked secure. 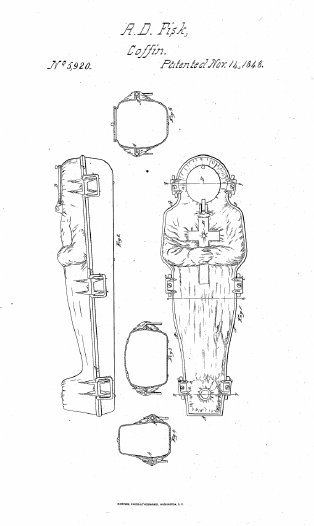 But security was not cheap; the price of a Fisk coffin was between $50 and $100. (A wooden casket cost $2.) Former U.S. 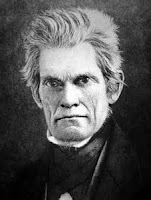 Vice-President and Secretary of State John C. Calhoun was buried in a Fisk coffin in April 1850, and after that, demand grew. But Almond Fisk was not doing well; he had become ill while fighting a fire that destroyed his foundry in 1849 and had never recovered. In October of 1850, Fisk died. His investors, John G. Forbes and Horace White continued on with the company. 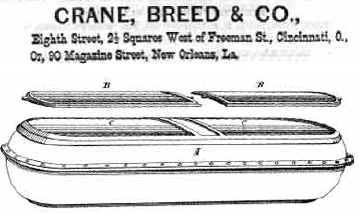 Soon after Crane, Breed and Company of Cincinnati obtained a license to produce Fisk coffins and several modified versions were introduced to the public. W.M. 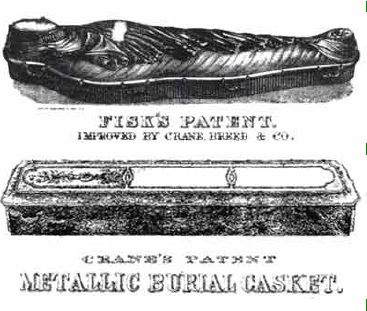 Raymond and Company of New York also produced several different versions of Fisk’s original iron coffin. The form fitting shape gave way to sleeker, more box-like shape with a window over the face and another over the hands of the deceased. The size of the windows increased and soon the top was all glass except for a dividing bar across the middle. Glass coffins became very popular in the late 1800s in Germany, especially when used for royalty and revered leaders. 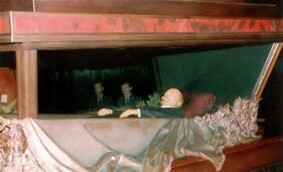 Vladimir Lenin is one of the most famous leaders who lies in state in a glass coffin in Red Square in Moscow. Others who rest eternally in a glass casket include Venezuelan President Hugo Chavez, China's Mao Zedong, Vietnam's Ho Chi Minh, and North Korea's founding leader, Kim Il Sung. While all-glass coffins are favored for viewing, they are not usable as a burial case because they are too fragile to have earth heaped on top of them and maintain their form. Today, glass caskets are still available, although not in the form you might expect. 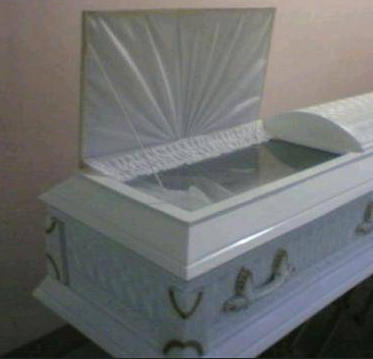 A glass casket is now a glass top that is placed over the deceased to deter mourners from touching the corpse. This also helps deter mourners from clipping hair, or pieces of clothing from the deceased to keep or sell as a memento. To view one of these “insightful” coffins, visit the Berry Funeral Home in Knoxville, Tennessee; Herr Funeral Home in Collinsville, Illinois; and the Pink Palace Museum in Memphis, Tennessee.